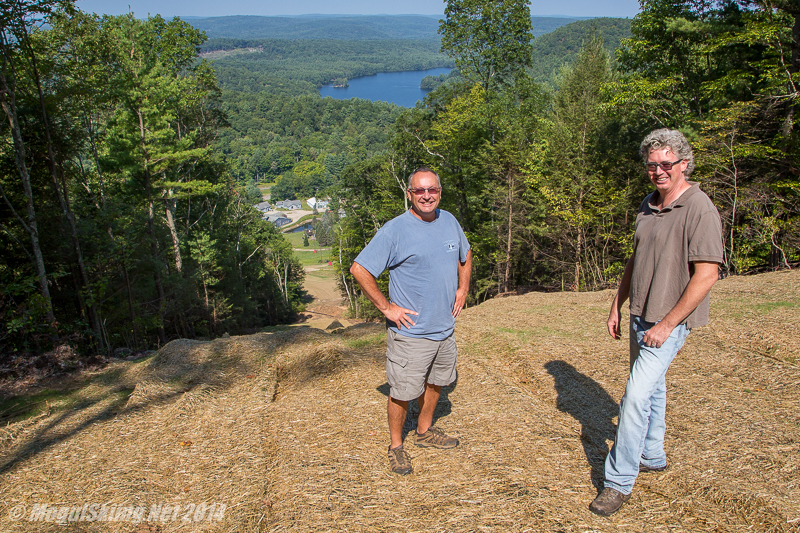 Ski Sundown General Manager Bob Switzgable and Operations Manager Chris Sullivan at the top of the new double black diamond mogul run: Satan's Stairway. Is the sport of mogul skiing growing? According to the management of Ski Sundown, a small but popular resort in northwestern Connecticut, it is. MogulSkiing.Net recently visited the area to get a preview look at “Satin’s Stairway”, a newly cut double Black Diamond trail the resort built this summer specifically to cater to its growing mogul skiing clientele. 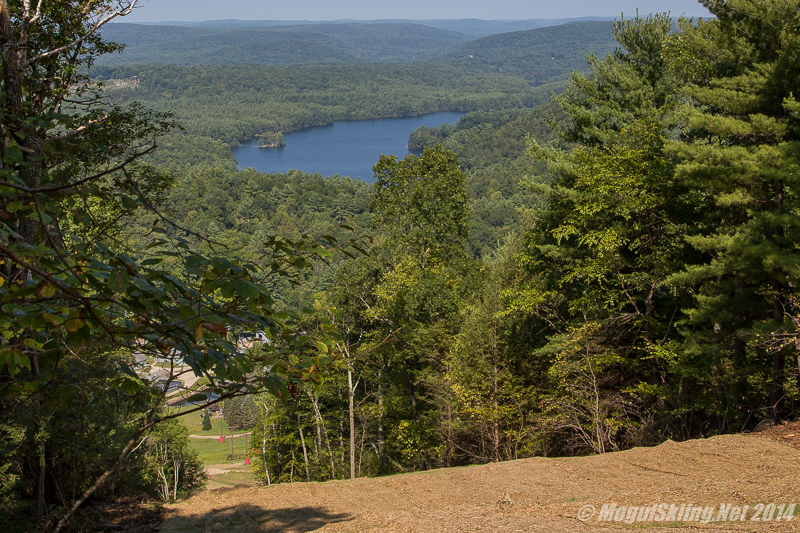 Located in New Hartford, Connecticut Ski Sundown is about a 45 minute drive northwest from the capital city of Hartford. The area has a total of 16 trails, three triple chairlifts, two conveyor lifts and a vertical drop of 625 feet. Despite the modest stats Ski Sundown enjoys a brisk business during the ski season. Proximity to the well-off suburbs of the Farmington Valley, top notch snowmaking, a variety of park features, night-skiing on all trails and a ton of after school and kid’s programs all help make Sundown a busy place from December to late March. As any mogul skier knows, good mogul skiing terrain has become an endangered species in the downhill skiing ecosystem. The general skiing public considers moguls a nuisance as opposed to a fun challenge leading resorts to push their grooming capabilities and park features. Given the climate it came as a surprise when Sundown stated their intention to earmark their new trail specifically for moguls. Ski Sundown’s Operations Manager Chris Sullivan says that overall there appears to be increasing interest in skiing moguls amongst the skiers at Sundown. “It’s mostly with younger people,” he says “the kids are finishing off their park runs through the bumps.” Both Sullivan and Switzgable also feel that some more challenging terrain would appeal to the parents who are skiers themselves but tend to drop their kids off at the mountain rather than stay and take a few runs. For a small resort Ski Sundown has to cater to a skiing (and snowboarding) clientele with a diverse set of interests and needs. That includes a dedicated and very vocal contingent of local mogul skiers. In the past Sundown has let some of their intermediate runs bump up in order to offer mogul skiing. Having a new dedicated bump run will allow the mountain to repurpose the intermediate runs back into groomers while giving the mogul skiers exactly what they’ve been asking for. MogulSkiing.Net visited Ski Sundown on September 5th. 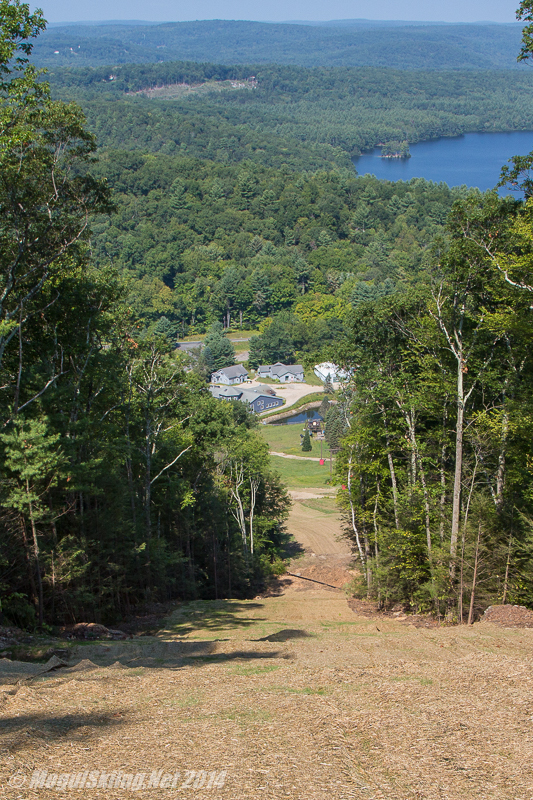 Clearing of the new trail was complete, the slope had been seeded with grass and installation of the supporting snowmaking infrastructure was in full swing. After an impressive ride to the top of the mountain in Switzgable’s Jeep, we were able to hike part way down the trail to check out the pitch, width and fall line. In terms of width the trail is a bit narrow by modern standards. Ski Sundown’s marketing materials are describing it as a “classic New England cut”. It appears wide enough for three, possibly four distinct zipper lines of moguls depending on how tight the bumps get. The pitch comes in three “steps”. After a short, almost flat run in from the chair skiers will come to the first crest where the trail angles down into a more intermediate steepness. Shortly after that is a second crest. This is where the real steepness starts. Most skiers will likely ski down to this point and stop to gather themselves before tackling the main portion of the trail. The rest of the run is a consistently steep pitch straight down the fall line to the bottom. Given the length, most reasonably accomplished mogul skiers will probably ski the steep portion of the trail from the top of the second crest to the bottom in two or three sections. By the time winter rolls around Ski Sundown plans to have both the snowmaking system and lights for night skiing operational on Satan’s Stairway. “There’s no point in having it if we can’t open it” says Sullivan. Both Sullivan and Switzgable insist the trail will receive the same priority in terms of snowmaking as all other trails on the mountain. The resort now known as Ski Sundown first opened in 1964 as “Satan’s Ridge Ski Area”. It was renamed Ski Sundown following an ownership change in 1969. The Sundown team chose to name the new trail “Satan’s Stairway” in part as a throwback to the resort’s early days.